As a Maryland girl through and through, I've been rooting for Michael Phelps, the most decorated Olympian of all time, since pretty much forever. Earlier this week, Phelps was determined to beat Chad Le Clos of South Africa in the men's 200m butterfly final and, as a surprise to virtually no one, he did and earned his 20th gold medal. I was beaming and also wondering if he secretly wants to yell "O" during the national anthem, a tribute to our beloved Baltimore Orioles and a time-honored Maryland tradition. 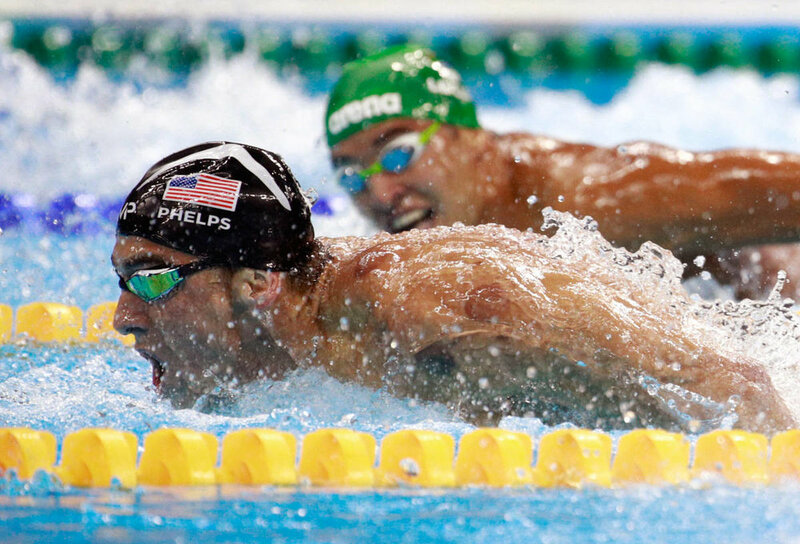 The next day, a picture surfaced of Le Clos turning to look at Phelps during the race while Phelps was looking straight ahead. The lesson here for all of us, Olympians and mere humans alike? Stay in your own lane. Literally. Did glancing over at Phelps cause Le Clos to lose the race? The world may never know, but it certainly didn't help. When you're focused on your own lane, you're not worrying about everyone else. You're essentially competing against yourself, your personal best. And that, honestly, is the way it should be. But I can admit, I've often fallen victim to doing the same as Le Clos, especially when it comes to blogging. She has a million followers, she's making a six-figure income, she's getting all these endorsements AND a book deal...what about me?! As my mom constantly told me growing up, "what's meant for you, nobody can take away." And, to be perfectly honest, the blogging about blogging, the how-to-make-money-off-your-blog posts? That's never been me, will never be me, and that's okay. But despite writing about social media comparison over and over, sometimes I can't help myself and I don't practice what I preach. And then I scold myself because I know better, but I do it anyway. I fangirl over bloggers and writers I love in the same way normal people idolize Beyonce (don't believe me? Check out this post where I met Awesomely Luvvie and Afrobella IRL). But Queen Bey isn't real. I mean, she is, but she isn't. She's not attainable. Meanwhile, my blogger and journalist girl crushes are actual human beings. Lately, I've been obsessed with Elaine Welteroth, the editor-in-chief of Teen Vogue. Why? Well, she pretty much has my dream job. Ever since I was a young girl, I've wanted to be EIC of a teen mag and Elaine and I have a few similarities: we're both Black (she's biracial), we both worked for the same magazine (albeit at different times) and we're both 29 (okay, I turn 29 in two months). But still: I am Elaine. Elaine is me. She's a constant reminder of what could have been had I not called it quits in journalism. Could I be EIC of Teen Vogue if I'd stayed the course? We'll never know. But sometimes, late at night when the rest of the world is sleeping, I do wonder. What if? On the surface, I appear to be a confident and successful women with a great career, a wonderful husband and a pretty awesome life. All of those are true. But I'm also human and I sometimes deal with the same fears, doubts and insecurities as everyone else: Do I matter? Am I good enough? Well I ever accomplish anything great? I am queen of the one-woman pity parties (bless my husband and fellow blogger friends for not indulging me, but trying to talk some sense into me). Like my friend Melissa Kimble, founder of #blkcreatives and social media whiz extraordinaire. After a particularly pathetic pity party (try saying that 10 times fast), she texted me perhaps the best pep talk ever, so much so I took a screenshot to save for those very moments when I'm feeling down on myself. The line that struck me the most was "You can only get to your next level by being you, not anyone else." Yes, I'm aware this is basically what my mom has been telling me all along, but it's different when it comes from your peers. Don't judge me. That same day, I stumbled across a speech by Oprah at this year's Essence Fest. Now, I don't claim to be Mama O's biggest fan, but this right here? Insert ALL the praise hand emojis. "You don't get what you wish for, you don't get what you hope for. You get what you believe. So what is it you believe to be God's dream for you?" What is God's dream for me? I'm still not really sure. But I know I won't get there by constantly comparing myself to other people. I'm a gifted writer and my superpower is empowering women through storytelling. That is my lane. And I'm sticking to it.